Out of the darkness slides forward smoothly a strong, masculine hand. An unseen smile and a firm handshake says, "It will be done, sir. But of course." Move the steering stalk-mounted drive selector into drive and we whisper forward into the night. 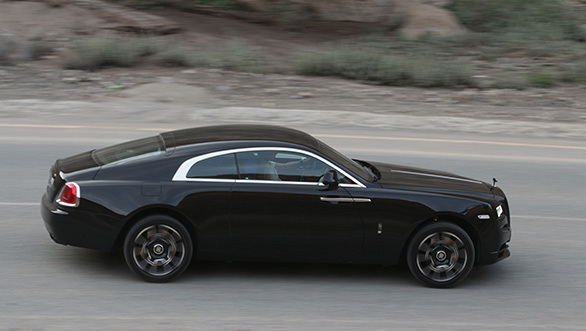 The glossy back of the Rolls-Royce Wraith Black Badge ends where the night begins. And it's ours today. 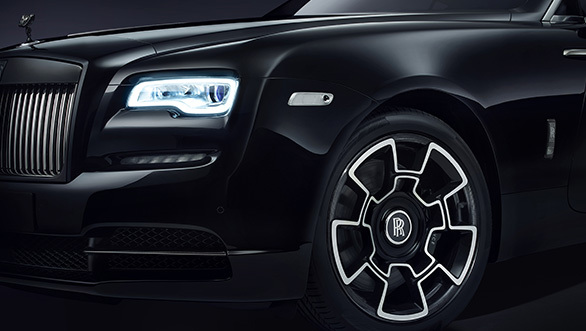 The night and the most powerful of all of the Rolls-Royces. 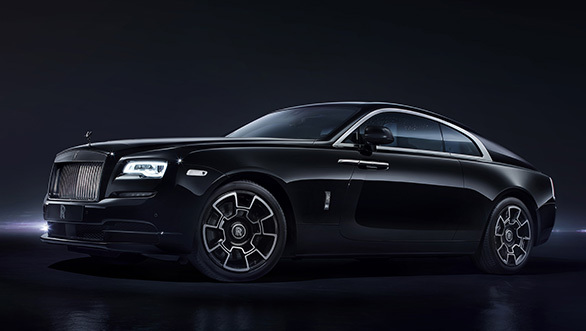 The Rolls-Royce Wraith Black Badge media kit is full of imagery. Word pictures of powerful, capable people who got it done. And then claimed their just rewards as they so richly deserved. On the sidelines of our drive, the story varies only slightly. Rolls-Royce's concerted effort to find a younger, more swish clientele is clearly bearing fruit. But with youth comes a natural resistance to playing within the boundaries. And so Rolls-Royce decided to jump in and see if they couldn't create a bespoke experience that high-classed what the youth were doing to their Rolls-Royces. Meet the menacing Black Badge. What a name that is. The lead shot of this story seemed underexposed and dark-hued just because the cars in the photograph wore that name. And it really is very black. 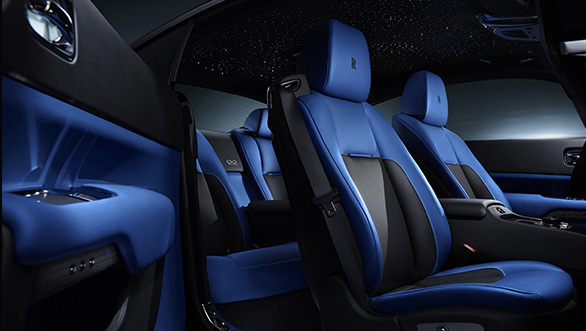 As it is with luxury and Rolls-Royce, the most ordinary of things is special. So the paint on the Ghost and Wraith is the blackest paint of all. And the traditionally silver on black badge is now a silver Double R Logo (capitalisation by Rolls-Royce, naturally) on a black plaque. All of the chrome has gone into stealth mode. Even the Spirit of Ecstasy embraces the darkness. But that isn't all. On both cars you see what looks like an ornate rim on which the tyres sit. It's more than decoration. 22 layers of carbon fibre folded over make up the rim which is titanium-ed to the aluminium rim. The powerful, unabashedly square-shouldered silhouette projects power. It makes the white and blue Dawn accompanying us look like a toy in the gathering dusk. Yes, quite right old chap, let's get inside the automobile, shall we? The basic colours chosen are decidedly non-subtle for the interiors. A bright purple and an equally arresting blue for the Ghost and Wraith respectively. The first time it makes you pause. In an oddly contrasty way, the colours make sense. Like an austere white house with a luminous azure pool in the middle of it. Or the solid hue of the inside of a dark-ceilinged posh nightclub. 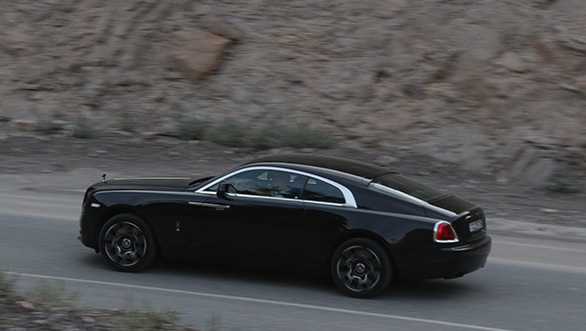 The Wraith is interesting to drive. The steering has heft and despite being the driver's car, it wafts along beautifully. "There's a pothole ahead, sir" translates only to a distant thud if you don't change direction. Rolls-Royce took the 623PS 6.6-litre V12 and added over 70Nm more torque while tweaking the gear change pattern and the weighting of the throttle pedal to create a more powerful, more responsive effect. The Wraith surges forward urgently when you floor it as the iconic power reserve meter raises a hint of an eyebrow before the needle rapidly heads counterclockwise as make effortless speed. The Ghost receives both more power (40PS more) and torque (60Nm more) and it is fast as well. But the Wraith feels more, erm, appropriate to drive like this. At the very least, there is a muted growl when the revs come up and the transmission alters shift points to in response to how hard you're on the throttle. I am not sure, "Step on it, James" has the same sensory sizzle to it even Bond was driving. In that spirit, the 6.6-litre V12 Ghost feels less alert and the growl is more distant. But you'd be foolish to think that the Ghost is slow because of the lack of drama. Naturally, the Goodwood special forces have endowed both cars with bigger, more responsive brakes in keeping with the idea of these powerful cars. Not there were many corners on our route, but the Ghost rolls a fair bit more into corners than the Wraith. But both cars have fat wheels and suspension that are heavily biased towards the ride experience while allowing the prow to track the road accurately enough. Would you drive bashfully up the nearest mountain road? I'd say you might actually enjoy it a bit, in fact. Both cars also wear all the other signature Rolls-Royce features. Like the decadent, utterly useless starry headliner. But it's gorgeous. I'd definitely order one. The Black Badges also have these infinity logos sprinkled over them. They represent the idea of there being no limits to what it possible. In fact, that brings us to the wood inlay on the dash. Yes, I'm kidding, that isn't wood. Rolls-Royce has a new aluminium-carbon-fibre mesh that is made exclusively for the Black Badges and is lacquered and polished to a gleam. It looks high-tech and more with the times than wood and I actually rather liked it. As Black Badge customers are wont to do, I imagine, I never actually got in to the rear seat of the Ghost. I am reliably told that there are houses in Mumbai that have less space, and the shag carpeting is definitely something to write home about. If I am honest, the flood of little Rolls-Royce factoids makes me want to roll my eyes when I see cascades of them in articles. You know like how all the wood in the car comes from one tree so that the patterns match. And the company will keep that wood aside for you, just in case. Or that you can order your favourite constellation to be the centrepiece of the starry sky above you. But just like the last time I drove one these fine, large automobiles, you get rocked back on your heels by how persuasive the story is. It quells the cynic, the Rolls-Royce. The idea that every whim you have about how your car should look or feel is possible is a powerful one. The deadly earnest with which the Rolls-Royce people go about turning whims into reality is very endearing. It makes the impossible seem possible and that's part of the lore of Rolls-Royce. Take for a final example how this story happened. Bert drives up to me in the dark basement of the office and rolls down his window. 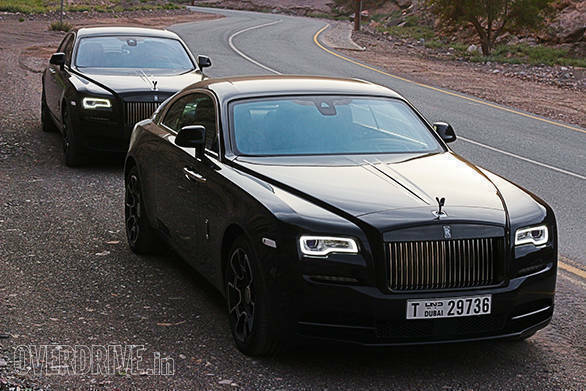 "Shumi, I need you to go drive the new Rolls-Royces Black Badges." Out of the darkness slides forward smoothly a strong, masculine hand. An unseen smile and a firm handshake says, "It will be done, sir. But of course."